Police said Nerf wars can create unintended dangers. HEBRON, Ky. — A game popular among teens has neighbors and police concerned. 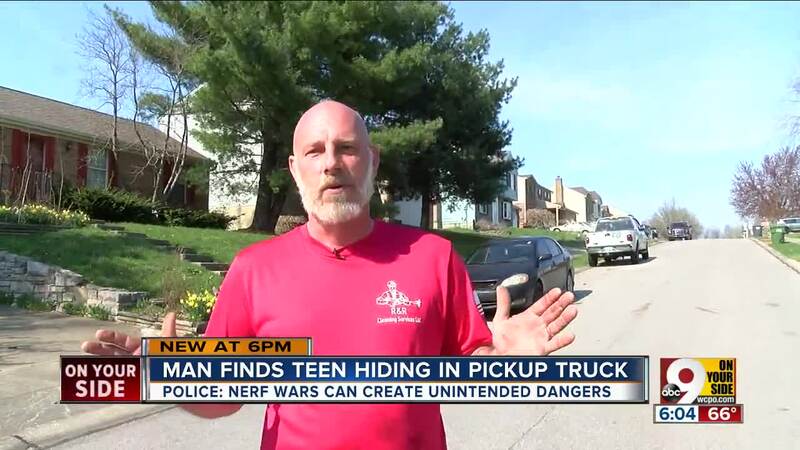 The seemingly harmless Nerf Wars across the Tri-State are leading teens into potentially dangerous situations, according to police. Take this situation on a quiet, residential street in Hebron. It became a whole lot more dangerous during Conner High School's Nerf Wars this spring. Ray Hembree says he walked into the middle of street trying to stop Nerf Wars players from speeding. "When I have to get out in this area to stop a vehicle, that's ridiculous … 80-90 mph … I will put my life on the line for any of these kids in this subdivision," Hembree said. That's wasn't the end of it. Walking back to his yard, Hembree spotted someone lying in the back of his truck. "He was laying in the back of the truck and I asked him, “What are you doing?' " Hembree said. The Boone County Sheriff’s Office hopes to avoid that kind of tragedy. "I don't believe that these kids are purposefully trying to infringe on property rights or create an unsafe driving situation in a community,” said Lt. Philip Ridgell, “but the awareness needs to be that people notice these things and they report them to us and we just want to bring those things to the forefront so the community is a little safer." Nerf Wars are not school sponsored. When the game was in full swing at Boone County high schools, law enforcement got a lot of calls. Ridgell wants to make sure the worst doesn't happen.